Has Twitter jumped the shark before it has earned a penny of revenue? It seems the social network has diversified into the wine biz, albeit for charitable purposes. The new venture, Fledgling Wine, is chronicled by Maya Baratz, SFoodie blogger, in Twitter is Launching Its Own ‘Fledgling’ Wine Label. Dogpatch-based Crushpad — a place that allows amateur vinophiles to make and sell their own wine, brand and label included — has more than a little in common with Silicon Valley. The business philosophy behind both calls for investing in the product and customer experience, with revenue naturally following. Not only can you buy the wine, you can pitch in a string of related events, ranging from what Dorrance said will be Crushpad’s biggest “virtual” barrel tasting to a possible label design contest. Odd, but interesting. And, it’s all for a good cause. Buy some here. 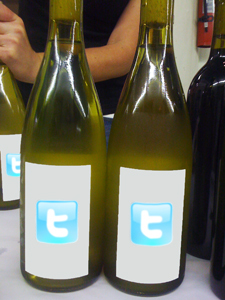 This entry was posted in Chardonnay, Pinot Noir, Red Wines, White Wines, Wine News and tagged crowdsourcing, twitter on October 15, 2009 by Roger.